A Discussion Forum For Anything And Everything For Locksmiths, Hobbyist Lock Pickers, Locksport, Lock Picking, Lockpicks, cutaways, and security. Simply The Best Lockpicking Forum Around! 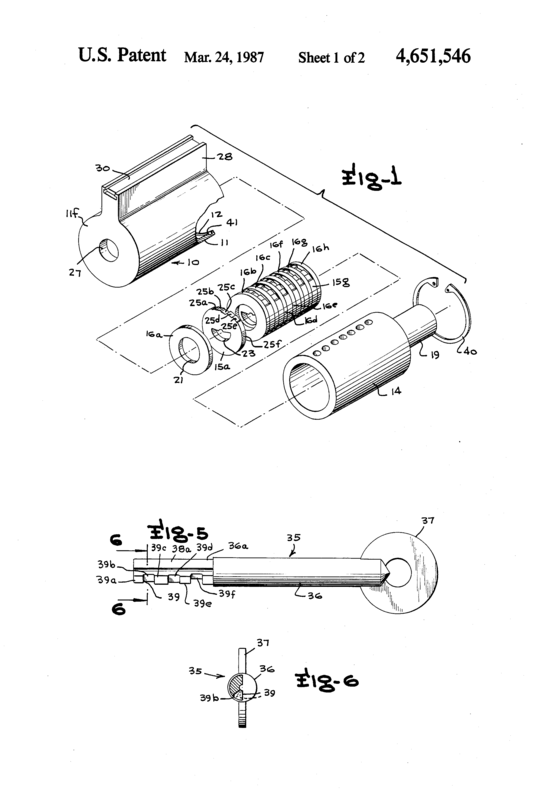 So, when searching for another patent, I happened to stumble upon this mechanism, assigned to Sargent & Greenleaf. Basically, it's a hybrid between a disc detainer and a pin tumbler lock. Very interesting construction. I certainly haven't seen anything like it before. Has this ever been produced? Wow, that is really neat. I have never seen or heard of them making any. There might be some made up to test things but they were never produced AFAIK. Given the date I bet they tried to design a core to go with their high security padlocks but I guess it never passed testing. Holy Crap! that's frikin cool man! thanks for finding and sharing that patent! Awesome concept! Shame we never saw it in reality. In case you haven't read the actual patent, it's actually more interesting than what a glance at the drawings would imply. By this construction, a more pick-resistant lock is provided since torque cannot be applied to find the shear line, the tumbler discs as well as the other parts being rotatable a full 360° without applying force to the inner cylinder unless all of the tumbler pins are properly aligned with the shear line. Similarly, this renders the lock highly resistant to unauthorized opening of the lock by torquing techniques. Since the key in this lock construction never comes into contact with the tumbler pins and the tumbler discs with the inner cylinder or plug 14 when properly positioned by the appropriate key rotate 360° without applying force, the lock is impression proof. Reminds me of eg. newer Kwikset Smartkey or certain car locks, where you can't tension the damn thing. Patrick Star wrote: In case you haven't read the actual patent, it's actually more interesting than what a glance at the drawings would imply. Maybe I'm missing something obvious, but how does the key reliably open the lock then? If it can spin freely, why should the pins lining up bind the second cylinder enough to start the lock turning? Once the pins have started to clear the shear line it's no longer a problem because the lock will hold the discs in place to prevent the discs from free-spinning. But I don't understand how to start it. I don't see what compels the plug sleeve to rotate together with the tumbler section. Thoughts? Cheesehead, I was wondering that myself... I think the idea was that the angled flats between 'levels' on the discs pushing against the pins themselves would provide enough to turn the cylinder once the pins were aligned to the shear. 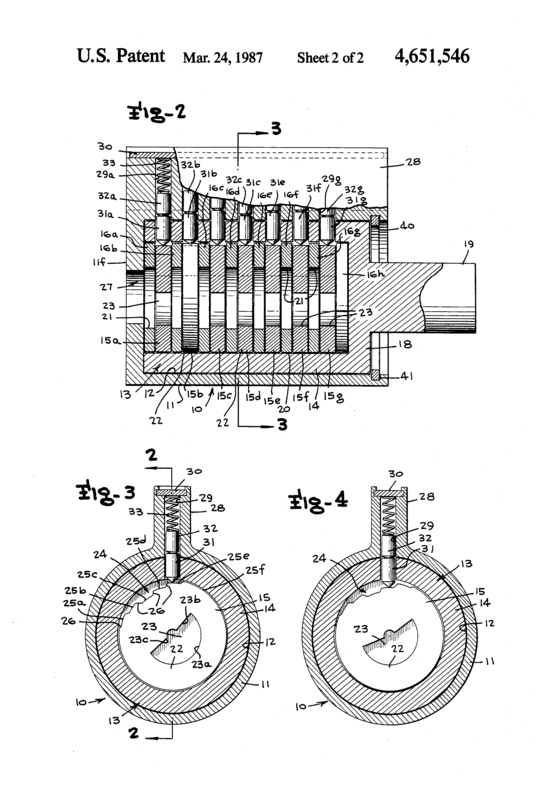 "When the lower pin sections 31 are all properly positioned upon appropriate rotation of the proper key, so that the plane of separation of the upper and lower pin sections becomes aligned with the shear line or shear plane 14a between the sleeve or shell member 14 and the bore 12, the lower pins then transfer force to the inner cylinder tending to rotate it by continued rotation of the key to rotate the plug assembly to the unlocking position, and similar action caused by the pins pushing the side of the inner cylinder upon rotation of the key in the opposite direction return the cylinder to the unlocking position where the lower tumbler pin sections are then positioned axially to place their planes of separation with the upper pin sections out of alignment with the shear plane or interface plane 14a, returning the lock to its locked condition." My guess is this didn't work as dependably as they hoped, and probably why it never made it to production... Seems to me that any resistance to the inner cylinder being able to turn freely (dirt in the lock or a stuck tailpiece or whatever else) would cause the discs to continue past the alignment point, oversetting or undersetting pins that were at the shear line and allowing the key to freely turn without any effect. Brilliant - are they actually produced? Never heard of or seen one of them. But it certainly looks to be highly prone to failure with the lightest amount of dirt or corrosion. Can see why it would not be produced. Probably a concept that they patented in case someone else made one. Clearly, they were inspired by the Abloy Profile system. Probably figured that the pin tumbler mechanism would be an improvement on the sidebar mechanism. Perhaps they could make part work like the Yale PKPT padlocks, where once the key was rotated correctly the plug could be pushed in slightly, engaging an outer shell or cam/tailpiece that would operate the locking mechanism. Sort of like the Bowley lock. Then the key would work correctly and reliably. Just some thoughts and ideas. GWiens2001 wrote: Perhaps they could make part work like the Yale PKPT padlocks, where once the key was rotated correctly the plug could be pushed in slightly, engaging an outer shell or cam/tailpiece that would operate the locking mechanism. Sort of like the Bowley lock. Then the key would work correctly and reliably. Unfortunately I think any lock that has an opening procedure other than "insert key and turn" is out of the question for the mass market. Wow, that really is an outstanding find. It absolutely reeks of "Let's make our own military padlock core, we can't use Medecos forever". And look at the length of the shaft on that key. S&G can't help themselves, they're a safe lock manufacturer first and foremost and as well as tucking the locking mech way up out of harm's way inside a padlock, I'll bet you they were thinking of inch-thick safe doors as well. As the other guys have said, it's pretty obvious why it didn't get made. I'd add also that there's no obvious way of keeping the discs at zero rotation to aid the entry of the key, AND with all these extra parts you're multiplying complexity and numbers of parts to the point that the gains in security are far outweighed by the potential for failure and lockouts. The manufacturing tolerances on this thing would have to be epic to get it to function smoothly. When you spend some time browsing patents, you notice that there are lots of things patented that have never been close to seeing commercial production. Not only locks, but essentially every area. Electronics, software (where appliciable), pharmaceuticals, etc. You also - perhaps somewhat more surprisingly - find many patents that would never hold up to a challenge in court (due to prior art, obviousness, etc). And this goes way back (early 1900s if not earlier) and continues to this day. I think it's basically a way of making your competitors lives more difficult by filling any potential invention space with patent hazards that at the very least have to be investigated and occasionally also worked around. And since everyone else is doing it, you'd be at a competitive disadvantage if you didn't. Since the major cost when patenting something is the lawyers to do the necessary investigation and write the actual patents, you can probably achieve very good economics of scale if you're a major corporation with a fully staffed in-house legal department.